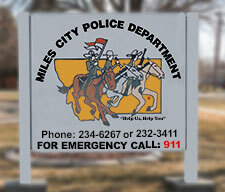 Thank you for visiting the Miles City Police Department’s website. This website is provided as a public service. In an effort to reach the broadest public base, the Miles City Police Department will strive to design and maintain its website’s pages to facilitate access by persons with disabilities; wherever practical and feasible. The top of each page containing navigation links shall have a “skip navigation” link. Website pages shall be designed so visitors may change the font size. Website pages shall be designed so that information required for navigation and meaning is not dependent upon specific colors. Background colors shall be limited. Website pages shall be designed so that information required for meaning is not dependent upon sounds. Links in the website shall have a text description that can be read by a screen reader. Photographs, graphics and other images on the website shall include HTML tags with text equivalents of the material being visually conveyed. As a convenience to our visitors, we may provide links to other websites, where we believe the information contained on those links is relative and may be of interest. If you use a link to any of these external websites, please be aware that they may not be designed with the specific accessibility features that the Miles City Police Department adheres to. Links to external sites are provided solely at the discretion of the Miles City Police Department, and may be revised at any time. We welcome your comments and suggestions on our website’s accessibility. Please use the secure form below to communicate your input. We appreciate your assistance in helping us to maintain a fully accessible website.